Linuxslaves.com - The LibreOffice 6.2.2 is finally available and to install via PPA repository. 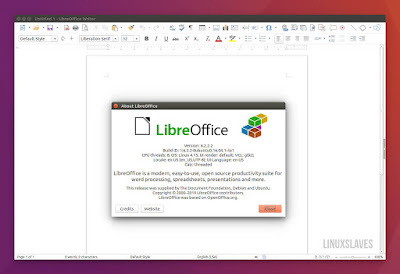 This is a major release of the popular free office suite alternative to Microsoft Office. According to its release note, the new release brings new approach to the user interface, improved icon, tidier context menu, better compatibility with Microsoft Office files, and performance improvements. The new NotebookBar aka Ribbon has been moved out of experimental and now it's available out-of-the-box (as an optional). You can change the UI by heading to the View > User Interface and select your preferred layout. Ubuntu 18.04 and higher is not required run apt update since it automatically refresh repository caches after adding PPA. Alternatively, you can launch Software Updater if you have any previous version. These were all to how to install latest version of LibreOffice in Ubuntu, Linux Mint, and other Ubuntu based distribution. Thanks for reading!.